Maximise space with in-built seating. How is your garden looking at the moment? If it is nothing more than a few misplaced pavers or a tuft of weeds, you are not alone. 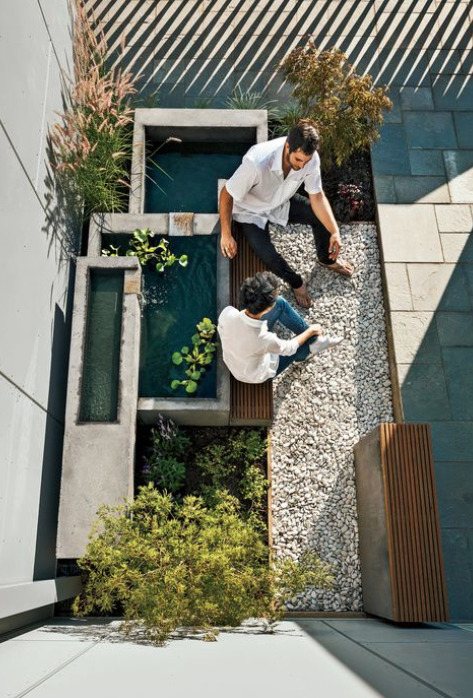 So many city dwellers miss out on the opportunity to create their own little oasis simply because they don’t see the potential of their outdoor space. The good news, however, is that no matter how small your outdoor space is – and this includes balconies – there is always a way to create your own retreat. Spring may feel more like summer this year, but don’t let that stop you from donning the garden gloves and putting your own touch on your outdoor space. By the time we are in the thick of summer and you are sipping a cool beverage amongst your revitalised garden, you’ll be glad you made the effort. So get ready to get some dirt under your fingernails, because there are plenty of benefits to be gained from nurturing your outdoor area. Here are some of the top reasons to give your green thumb a workout. Gardens and pot plants aren’t luxuries – they are a necessity. When you embrace your outdoor space, you give yourself a chance to connect with nature on a regular basis. No matter how grand or small your garden is, it will enhance your sense of peace and wellbeing. As urban environments become more built up, we quickly forget how important it is to spend time in natural environments. By harnessing your outdoor space, you give yourself a chance to slow down and connect with nature on a regular basis. Observing your plants as they blossom and simply being present amongst them as you tend to the watering is both humbling and peaceful. And as your garden comes into full bloom, you’ll be overwhelmed by a sense of satisfaction. Countless studies have explored these positive effects of nature, with one Harvard University study finding that people who spend more time outside in nature are happier and more productive. Unfortunately we can’t all take off to the mountains every weekend, so spend time investing in a garden instead to reap these benefits. Depending on your space, you can design your garden to give you more privacy, so you can enjoy spending time outside without feeling exposed to prying eyes. When you start to think about all the ways you can add shape, texture and functionality to the space through considered design, you’ll be surprised just what you can achieve. Even a small balcony can be segmented into zones and revitalised with a mixture of plants in beautiful pots. With clever planning, even the smallest spaces can become a sanctuary. Spending time outside in a shaded area is more refreshing than being cooped up inside under an air-conditioner, and it’s also better for the environment. By retreating to your outdoor space on sizzling days, you’ll not only feel revitalised, but you’ll also reduce the toll power-guzzling air-conditioners place on our over-used electricity grids. Maintaining a garden amongst the cityscape is also good for local biodiversity and keeping the air we breathe clean and healthy. Green spaces in the city are particularly important for sustaining our hardworking bee populations, which are declining in urban areas. You could even go so far as to put a small hive either in your garden or on your rooftop. There are a number of apiarists in Brisbane who can install and maintain a hive for you. When space is tight or soil quality is low, create a raised garden bed for your veggie patch. You pay for every inch of space your home occupies, so you may as well use it for more than simply hanging out the laundry. A lot of outdoor areas are poorly designed and underutilised, but there are plenty of ways you can integrate the outdoors into your lifestyle. Spend time getting the design right and you’ll increase the value of your home as a result of your outdoor renovation. When designing a garden, we always start by thinking about how we can create a connection between the indoor and outdoor spaces to promote seamless living. Enjoy the outdoors even more by creating a connection between indoor and outdoor areas. What will you create in your outdoor space? It’s time to look at your outdoor area with a fresh set of eyes. Think about its untapped potential rather than its limitations and you’ll be surprised what you can accomplish. Remember to plan carefully and research what elements are suitable for your space, and you’ll be well on your way to creating your own urban retreat. Use timber for a striking and structured contrast to lush foliage.